The new Camry is one of the best to come along for Toyota in some time. The fine-tuning and engineering in the latest 2018 surpasses the previous model, placing the Camry in the #1 spot for midsize cars according to US News & World Report. The mechanical changes to the engine have made it better for handling as well as fuel efficiency. At the base, you'll get a four-cylinder 2.5-liter engine that can put out 203-horsepower. However, at the top of the line is the 3.5-liter V6 engine. This comes standard with a few other features like paddle-shifters on the steering wheel. The eight-speed automatic transmission is standard on the base engine and top trims, but there are more shifters available with the premium trims for the Camry. The steering wheel can adjust more than other Camry models and can feel more competitive against stronger engines. 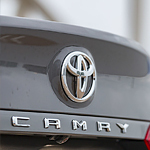 You can check out the latest Camry at Marion Toyota.